When it's time to start The Great Gatsby, you'll need some lessons to get you going at the beginning of the novel. This product includes a wide variety of lessons to help students through close reading and literary analysis. These lessons and activities are COMPLETELY EDITABLE on Google Drive and can be used to supplement your current plans, as homework assignments, or in any other capacity! For these LESSONS IN ACTION, check out my Instagram Highlights! I discuss using many of these lessons and you can see them for yourself! 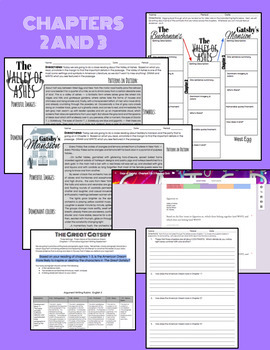 Gatsby: Chapter 1 Gender Roles Analysis: In this activity, students will look at small passages from chapter one and examine what they reveal about Fitzgerald's depiction of gender roles (at least at the very beginning of the novel - we revisit this later in the novel as well!). Teacher annotated guide: These are the things students most frequently point out about gender. Analysis Tool - Divided Venn Diagram: This is a new type of Venn Diagram that divides the circles into parts to help students more closely examine specific elements of a piece of writing. I've included both a blank copy and one ready to copy. Gender Roles Body Paragraphs - Revision Time: Here is an example of the writing that I collected from students AND a sample paragraph to help them make improvements. Reading Quiz: Chapters 2 & 3: These questions are "sesame street" style. Students receive four items. Then, they must explain HOW three of them are connected and WHY the remaining item does not belong. I've included an answer key and rubric for you to use! 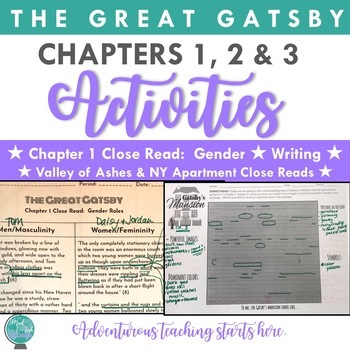 Close Read Analysis: The Valley of Ashes & Gatsby’s Mansion: Using two distinctly different sections of the text, students will close read and annotate for the different colors, textures, sounds, and other descriptions they notice in each of the two scenes. Formative Argument Writing Assessment: According to chapters 1-3, is the American Dream more likely to inspire or destroy the characters in The Great Gatsby? First and foremost, this product is 100% editable. Each of the resources is shared with you via Google Drive and you are welcome to make whatever customizations you need to best fit your students. I've worked hard to make each of these lessons rigorous, engaging, and creative. There are lots of "cute" ideas out there as well as some really tough and challenging ones: I strive to balance these two spectrums. 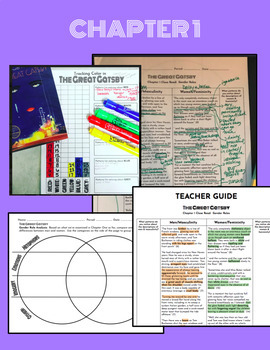 I take literary analysis seriously, but I work hard to create visually appealing and collaborative handouts and lessons to help facilitate critical thinking. 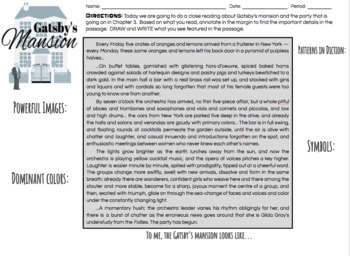 The Great Gatsby: PreReading Lessons, Activities, and Fun! Don't forget that leaving feedback earns you points toward FREE TPT purchases, so let me know how everything is working out! © Mud and Ink Teaching Please note - this resource is for use by one teacher only. Additional teachers must purchase their own license. If you are interested in purchasing several licenses, please let me know. Good luck on your adventurous teaching journey!